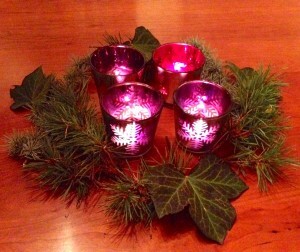 The Fourth Sunday of Advent! This excerpt is from the end of THE SCOTTISH PRISONER (aka DIE FACKELN DER FREIHEIT, in German). Wind struck the barn and went booming round the roof. A strong chilly draft with a scent of snow stirred the somnolence, and two or three of the horses shifted below, grunting and whickering. Helwater. The knowledge of the place settled on him, and the fragments of Scotland and Lallybroch cracked and flaked away, fragile as a skin of dried mud. Willie. God, Willie. I’m so glad they gave him your name. He seldom thought of his brother; Willie had died of the smallpox when he was eleven, Jamie, eight. But every now and then, he could feel Willie with him, sometimes his mother or his father. More often, Claire. I wish ye could see him, Sassenach, he thought. He’s a bonnie lad. Loud and obnoxious, he added with honesty, but bonnie. Want to read more? Click here for my “Fourth Sunday of Advent” blog from 2012, which features an excerpt from WRITTEN IN MY OWN HEART’S BLODD. Copyright © 2018 and © 2011 by Diana Gabaldon. All Rights Reserved. Please do not copy and paste this text and post it anywhere else including other websites and social media accounts (Facebook, Twitter, etc.). I love your books. I can read any part of a book and fall thru time to that time! I’ll be totally absorbed in their life in seconds! Ms.Gabaldon………………Many Thanks for writing the Books!!!!!!! !am Eagerly awaiting Book 9…….and I Do love the way Sony/Starz has done with Outlander……also Thanks to Mr. Moore!!!!!!!!!!!!! These last few Seasons Have Been So Great!!!!!!!!!!!!! Cannot wait for this Sunday!!! Merry Christmas and a Very Happy New year to You and Yours!!!!!!!!!!!!! I love reading your books. I also love outlander on Starz. I watch several times a week. My husband laughs because he thinks I am obsessed with the show but when I read the books it is hard to put them down I am almost done with drums of autumn and getting ready to read the fiery cross. I have a question for you I was wondering if you will ever do a book signing in Kansas city mo. I would love to get my book signed by you? New appearances and book signings are added to Diana’s website as they are confirmed. As to whether Diana will “ever” come to Kansas City… without time travel or psychic abilities, that would be hard to tell. Another option for books autographed by Diana, the Poisoned Pen bookstore sells new copies of her books with her signature, and they ship to anywhere in the world. There is no extra charge for Diana’s signature, only the cost of the book(s) and shipping. Look under Diana’s Resources menu on this website for more information. Wishing you a wonderful birthday! Have a great day! I’ve read all your books several times. Each time they move me. I cried again just now with empathy for the enormous heart-bursting love that a parent has for their child. Thank you again Diana.